On this page, find information pertaining to elections and voting in Sparta Township. If you have questions, telephone Township offices at 616-887-8863. Attention: In order to be eligible to vote in the General Election on November 6, 2018, new voters must register to vote by October 8, 2018. • 18 years of age by Election Day. • A resident of Michigan. • A resident of the city or township where you are applying to register to vote. Wondering which precinct you should vote in? Precinct 1: Anyone residing in the Village of Sparta. Precinct 2: Anyone North of 13 mile road. Precinct 3: Anyone South of 13 mile road. Check the Township precinct map at the link below. 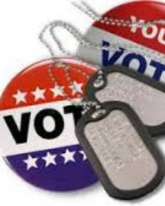 If you are a military or overseas civilian voter eligible to vote in Michigan, services are offered to help you vote. Check the link below. If you want to vote absentee, you need to meet one or more of these qualifications. • Must be 60 years of age or older. • Unable to vote without assistance at the polls. • Expecting to be out of town on Election Day. • In jail awaiting arraignment or trial. • Unable to attend the polls due to religious reasons. • Appointed to work as an election inspector in a precinct outside of your precinct of residence. You may download an absentee voter ballot application at the link below.